Video: Watch for a DISCOUNT! Secure Checkout through PayPal. You do NOT have to have a PayPal account to order on our website. Use your PayPal account or check out with any credit card. Our Student Booklet provides you with text, maps, and color state symbol pictures for your state. The text covers history, geography, map skills, weather, industry, agriculture, major cities, citizenship, state and local government, and state symbols. Students use this material to create their own personalized state history textbook, adding pictures and information from free tourist literature. Quizzes, Tests, and Answer Key are included. Our Master Lesson Plan Book gives simple instructions and flexible options. Choose between two project notebook options: My State Notebook by A Beka Book (grades 3-8) or a 3-ring binder (grades 7-12) or teach both options simultaneously. Plans for 6 weeks, 1 semester, 1 year, and continuing study. Print a FREE SAMPLE from our TEXAS book! My State History Funbook is a color-cut-and-paste project notebook that provides fun activities for young students as they learn about their state. This course is correlated to our upper level courses, so young ones can join right in with older students! Includes Activity Pages with cutouts for your state! Print a FREE SAMPLE of our Mississippi book! 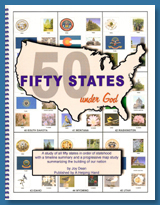 Fifty States Under God is a workbook study of all 50 states in the order of statehood. This “I love history” book emphasizes the role of God’s providence in shaping our nation. It includes a time line and a progressive map study along with the most interesting information from all 50 state studies. Color state symbol pictures for all 50 states are included! Includes tests, keys, teacher guide. Print a FREE SAMPLE of the Hawaii section! 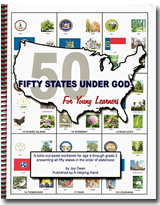 Fifty States Under God for Young Learners is a color-cut- and-paste workbook introducing all 50 states in the order of statehood. Color state symbol pictures and informational cutouts for all 50 states are included! Print a FREE SAMPLE of the Pennsylvania section! 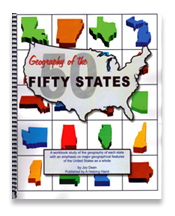 Geography of the Fifty States (grades 3-12) provides 4 pages per state in order of statehood. The growth of the US, state by state, is correlated with US geographical regions, showing how geography helped shape history. Student learns US geographical regions and geographical features. Includes tests, keys, teacher instructions. Print a FREE SAMPLE of the Kansas pages from Geography of the Fifty States! Sketches from Church History by S.M. Houghton is a 245-page, illustrated discussion of the events and people who have been instrumental in the spread of Protestant Christianity from the end of the Book of Acts to the end of the 19th century. It is exciting and inspiring, appropriate for grades 7-12. Use as a one-semester history or Bible elective or an excellent book report book. Adults will also want to read this book and add a copy to your own library! 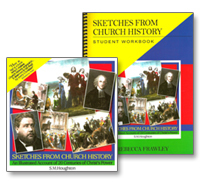 Sketches from Church History Student Workbook by Rebecca Frawley provides study sheets, 3 tests, answer keys, and a course schedule (18 weeks, 3 classes per week). Our Scripture greeting cards are unique for their beauty and their message. Click here to check out our Word In Season Cards.